These 240V, 10W / M kits are an easily installed and cost effective way of providing frost protection for pipes in all domestic and small commercial applications. (Please note that your pipe work still requires insulation). Contact your Cable Services Area Sales Manager or local Cable Services / Smith Electrical branch for further information. 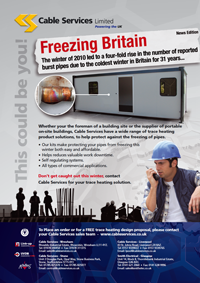 Whether your the foreman of a building site or the supplier of portable on-site buildings, Cable Services have a wide range of trace heating product solutions, to help protect against the freezing of pipes. Cable Services started distributing the Raychem range of self regulating Trace Heating cables in the late seventies and have over the years acquired a wide expertise in the installation of the whole range of nVent Trace Heating products. Our vast experience coupled with stocks unequalled anywhere in the UK makes Cable Services the only choice for Trace Heating materials. We are distridutors and stockists of a wide range of electric trace heating products which are listed on our main website. 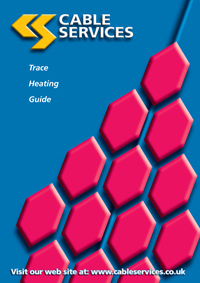 This micro site is a resource for specific manufacturers information on the range of trace heating cables we supply and provides in depth installation guidelines and pipe heat loss figures. Freeze protection: Every pipe or vessel is subject to heat loss when its temperature is greater than ambient temperature. Thermal insulation reduces the heat loss but does not eliminate it. Trace heating is used to replace the heat that is lost to atmosphere. If the heat replaced matches the heat lost, temperature will be maintained. An ambient temperature sensor can be used to energize the heating cable before the ambient temperature drops below freezing, 40°F is used as a standard. For example, a 15 mm copper water pipe at 5°C with 25 mm insulation in an ambient temperature of -15°C will lose 4.39 watts per metre. To prevent the pipe from freezing, much thicker insulation could be applied but this is both bulky and expensive. A trace heating system can supply the extra heat to prevent freezing. A thermostat is used to sense the ambient air temperatures and control the trace heating to maintain around 3 to 5°C in the pipe. 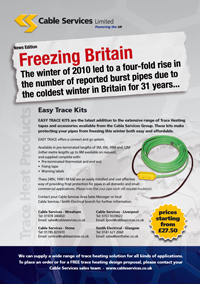 Typical residential applications for trace heating are the protection of water pipes against freezing. When trace heating is used in conjunction with common foam pipe insulation, the insulation will often melt, and precautions should be taken to avoid this. Use insulation that can be exposed to the elevated temperatures of the heat trace. Temperature maintenance: Hot water service piping can also be traced, so that a circulating system is not needed to provide hot water at outlets. The combination of trace heating and the correct thermal insulation for the operating ambient temperature maintains a thermal balance where the heat output from the trace heating matches the heat loss from the pipe. Self limiting or regulating heating tapes have been developed and are very successful in this application. A similar principle can be applied to process piping carrying fluids which may congeal at low temperatures, for example, tars or molten sulfur. Hit-temperature trace heating elements can prevent blockage of pipes. Industrial applications for trace heating range from chemical industry, oil refineries, nuclear power plants, food factories. For example, wax is a material which starts to solidify below 70°C which is usually far above the temperature of the surrounding air. Therefore the pipeline must be provided with an external source of heat to prevent the pipe and the material inside it from cooling down. Trace heating can also be done with steam, but this requires a source of steam and may be inconvenient to install and operate. In laboratories, researchers working in the field of materials science use trace heating to heat a sample isotropically. They may use trace heating in conjunction with a variac, so as to control the heat energy delivered. This is an effective means of slowly heating an object to measure thermodynamic properties such as thermal expansion. T2 Red - 5-15 watts per metre Self Regulating Cable. T2 Red - With T2 Reflecta. T2 Quicknet - Thin (3mm) Self Adhesive Mat. Self regulating eElectric trace heating for industrial temperature applications up to 110°C, including applications in ‘hazardous areas’ but not steam cleanable. Self Regulating Electric trace heating for process temperature maintenance applications up to 120°C which may be subject to steam cleaning. Self regulating electric trace heating for process control applications up to 150°C which may be subject to steam cleaning.